If you absolutely loathe biological classification and all of it's obscure terminology, you're going to hate the crustaceans. There are so many "split-hairs" amongst it's groups that science types have taken to making new infra-, sectional-, you-name-it categories to sub-divide all the groups. I guess that's what you get with such a collection of diverse organisms and excellent fossil history. Anyway it won't hurt my feelings if you skip on down to the next subject heading. The Phylum Arthropoda (="jointed legs"). With the insects, trilobites, spiders, horseshoe crabs, scorpions, ticks, mites, sea spiders, centipedes, millipedes, (whew!) and a few other various and sundry groups, the subphylum Crustacea helps make up the largest phylum of life (Arthropoda); with some three quarters of a million described species. They all share 1) Metamerism: a division of the body into definite segments. 2) A pair of appendages per segment (at least in the primitive condition). 3) A nervous system with a dorsal, anterior brain, ventral nerve cord and ganglionic swellings in each segment. 4) Similar embryology/development. 5) Chitinous exoskeletons that cover the entire body; growth through periodic molting. 6) A muscular system that moves the animal by pulling on the exoskeleton. Subphylum Trilobita. The fossil trilobites. Class Merostomata. The living horseshoe crabs and fossil eurypterids (some were big predators). Limulus polyphemus, a/the Horseshoe Crab. 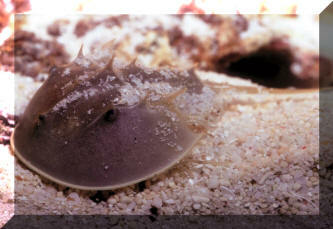 This species is principally a sand-sifting filter feeder, though there are other horseshoe crabs that are more predatory. Up to a foot in diameter. Most die from a lack of nutrition in captivity, due to insufficient size, depth, culture of live sand organisms. Aquarium photo. Class Arachnida. The scorpions, harvestmen, spiders mites and ticks. Class Pycnogonida. The sea spiders. A Systematic Resume of the Crustacea is necessarily large and complex. Allow me to semi-skirt around a full discussion here, giving just a systematic outline of Crustacean systematics and focus more fully on the individual groups of interest/use by aquarist at lower levels (on pages, linked elsewhere). Numbers in parentheses are current species counts. Class Cephalocarida (9), most primitive. Shrimp-like, less than 4mm long. Class Ostracoda (7500+), the Mussel or Seed Shrimps. Class Branchiura (130), ectoparasites on marine and freshwater fishes, e.g. Fish Lice, Argulus. Class Cirripedia (900), barnacles, many parasitic forms. Little shrimps that have settled down and attached themselves to the substrate with cement gland material, built a calcium carbonate house around themselves and kick food into their mouths. 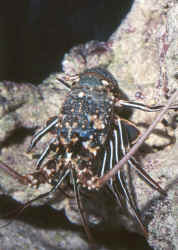 Representative of the Barnacles, below, Lepas anatifera (Smooth Goose-Neck Barnacle) in St. Thomas, U.S.V.I., some sessile barnacles in the Bahamas and Pollinices polymerus off of San Diego, California. Order Stomatopoda (350), the Mantis "Shrimps"
Class Malacostraca : Comprises almost three-fourths of all described species of crustaceans and most of the larger forms, such as crabs, lobsters, and shrimps. Characteristics: Trunks typically composed of 14 segments plus the telson ("tail"); the first 8 segments form the thorax, the last 6 the abdomen; all segments bear appendages. Four Superorders: Syncarida, Hoplocarida, Peracarida, and the one we want to talk about, the Eucarida. Order Decapoda includes the familiar shrimps, crayfish, lobsters and crabs. This is the largest order of crustaceans with @10,000 species. Decapods are distinguishable from euphausiaceans and other malacostracans in that their first three pair of thoracic appendages, The remaining five pairs are legs (Decapoda= "ten feet"). Decapods are divided into two Suborders, the Dendrobranchiata, with "tree-like" branched gills, body laterally compressed..., eggs planktonic, nauplius as the first larval stage (as in Artemia, our brine shrimp), and the Pleocyemata. Suborder Dendrobranchiata. Shrimps (but not all of the shrimps). Gills of a type termed dendrobranchiate (tree branch like). Bodies laterally compressed. Their first three pairs of legs are chelate, but not as enlarged chelipeds. Eggs in these shrimps are not carried by the female but are planktonic. Nauplius as first stage of larvae. Infraorder Penaeidea. Shrimps with well-developed rostrums. Lack overlapping pleura of second abdominal segment over first. Infraorder Caridea. Shrimps. Cylindrical cephalothorax. 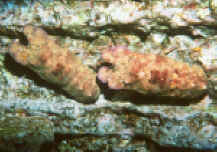 First two pairs of legs chelate or subchelate and cylindrical. Third pair chelate. Possess overlapping pleura of second abdominal segment over first. Gills phllyobranchiate. Sand Shrimps (Crangon), Snapping Shrimps (Alpheus, Synalpheus), fresh, brackish and marine Palaemonids (family Palaemonidae), Macrobrachium, Periclimenes and Hippolysmata ( Cleaner Shrimps). At right, a notorious non-scavenger amongst aquarium lobsters, the Blue, Panulirus penicillatus, typically collected out of Hawai'i for the trade. Family Scyllaridae , the Slipper, Spanish, Locust, Shovel-Nosed Lobsters. Superfamily Thalassionoidea, Marine burrowing Shrimps/Ghost Shrimp. Have compressed carapaces, first pair of legs as chelipeds, third pair not chelate. Well-developed abdomens that are long, flattened. Superfamily Galatheoidea, Family Galatheidae. Genera Cervimunida, Pleuroncodes. Crab/Lobster-like crustaceans with well-developed tail fans. First legs as chelipeds. Superfamily includes the Porcelain Crabs of the genera Petrolisthes, Pachycheles, Porcelana, Polyonyx, and the freshwater Aegla. I'll never complain about the taxonomy of the cichlids, characins, basses or wrasses again! Barnes, Robert. 1987. Invertebrate Zoology. Saunders. 893pp. Debelius, Helmut. 1999. Crustacea of the World. Atlantic, Indian, Pacific Oceans. IKAN, Germany 321pp.